A new Ms. National Carnival Swimsuit and a Mr. GQ 2016 have been crowned in a 2 for 1 competition held at Carnival Village. 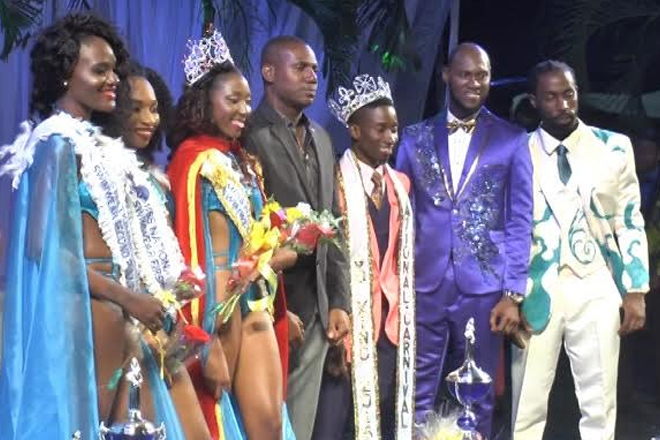 Around 2:50 am on Wednesday morning, Miss St. Kitts Nevis Anguilla National Bank, Shakira Pitt was crowned the new 2016-2017 Miss National Carnival Swimsuit Queen. Pitt beat out her competitors snagging the Best In Identical Swimwear segment, Best Onstage Interview along with the Miss Photogenic award. Following closely behind was Miss National Housing Corporation, Nakilah Watson who captured the 1st runner up position with a total of 1533 points. Miss NHC secured her spot after winning the award for Best in Body Painting, the Tropical Fantasy Wear segment and the National Pride Creative Wear segment. Miss SL Horsford’s and Co Ltd, Raven Richards placed runner up after scoring a total of 1365 points. Miss Royal St. Kitts, Zena Hyman won the Miss Amity and Best Platform Project awards while Miss St. Kitts Nevis Development Bank, Kachiana Robin won the Chairperson’s Award. Meanwhile, Mr Office World St. Maarten, Desyl Hamilton was crowned the 2nd ever 2016- 2017 Mr GQ after winning the Beach Wear and Performing Talent segments. 1st runner up went to Mr SKNVibes, Joseph Tudor with a total of 1417.5 points while 2nd runner up went to Mr Royal Logistics, Kevin Adams who amassed a total of 1408 points.